Visit BG booth #5842 at AAPEX | BG Products, Inc.
WICHITA, Kan. – October 4, 2016 – In November, BG will have a booth at the biggest show of the year – the Automotive Aftermarket Product Expo (AAPEX) at the Sands Expo in Las Vegas. The highlight at this year’s show will be the new, revolutionary BG GDI Fuel/Air Induction Service. 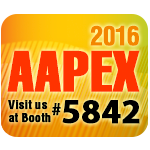 AAPEX helps shape the future of the automotive aftermarket industry. On November 1-3, AAPEX will host 2,200 exhibitors displaying the latest products and services to diagnose, service and maintain the nearly 1.2 billion vehicles on the road throughout the world. Almost 160,000 automotive aftermarket professionals from more than 140 countries will be in Las Vegas during AAPEX. At booth #5842, BG experts will be educating aftermarket professionals on the value of BG services using a full-sized cutaway of a Corvette and a GDI engine. BG Products, Inc., is dedicated to making vehicles last longer and perform better. In partnership with an international network of distributors, BG serves the driving public with innovative products and proven programs of automotive maintenance. Click here to see our complete line of BG products. Click here to find your local BG Distributor.